The Bridgemen are legendary in many drum corps circles. 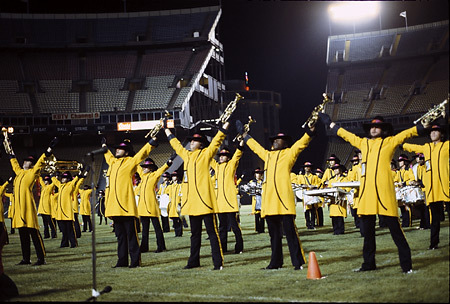 As pioneers of pure entertainment in the mid 1970s, the corps and its members enjoyed many successful seasons. Returning to the field in 2005, members of the Bridgemen Alumni Corps have once again entertained the masses at events such as the DCI Eastern Classic in Allentown, Pa. Several members recount their experiences with the Bridgemen during the 1970s and '80s and talk about their experience with the current alumni corps. Jim Jordan is drum major for the corps. 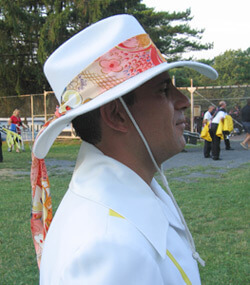 He saved his hat scarf from 1977 and brought it back for 2007, the 30th anniversary of Bridgemen winning the very first DCI East Regional in Allentown. The hat scarf that I wore was the one that was on my hat in 1977, when Bridgemen won DCI East by a very large margin. I played mellophone that year and I was 17 years old having the time of my life! I still have the scarves from each of my four years with the Bridgemen, 1977-1980, and I thought it would be nice to wear one during this year's performance in Allentown. When I showed it to Dennis DeLucia, our program coordinator and percussion arranger, he was quite surprised that I still had it! I still have several mementos from my days marching in DCI events, as those were some of the most incredible times of my life! Prior to our performance this year, I walked around to each and every member of the corps and asked them to touch the scarf for good luck, and to perhaps "feel" the magic of that very special night back in 1977 when we felt like we were on top of the world! It was a magical experience then; and now, 30 years later, it was magical once again. I was very proud to march with the Bridgemen when I was younger, and I am equally proud to march with our present corps. Our family has grown and we have assembled a beautiful group of people as our dream has been restored, again. We are all having the time of our lives, and it has been incredibly fun and rewarding to reconnect with the audiences at each new show. Jerry Baldauff was a member of Bridgemen from 1979-1983 and has marched as a baritone player with the Bridgemen Alumni Corps the past two seasons. Allentown is where I first saw the Bridgemen perform live in 1978. I was a member of a small drum corps and was at my first ever DCI East with some drum corps friends. When the Bridgemen came on, I was able to find a standing room only spot on the concourse on the 50-yard line. In 1979, a few of my drum corps friends wanted to try out for the corps and asked if I was interested. At my first practice, the man that stood next to me addressed the members. It was DCI Hall of Fame member Bobby Hoffman. To this day, when I am on the field in Allentown, I can envision some young boy in the stands watching what will become his favorite corps. Dave Gambal marched as a member of the Bridgemen percussion section from 1980-1983. He also was a member of the corps' percussion staff in 1987, the last active year of the junior corps. I've marched as a member of the Bridgemen Alumni Corps since it started in 2005. One of the main reasons I joined the corps was because of the high caliber staff members including Dennis DeLucia, Pat Scollin and Bob Dubinski. Knowing that these guys were involved and what they helped accomplish in the 1970s and 1980s with the Bridgmen, I knew it was going to be good. I've played the "quints" since I've been with the Alumni Corps. It's been wonderful renewing old friendships and creating new ones. Our group has always been focused on bringing quality entertainment to our audiences. We did it in the past and hope to continue to do so through the Alumni Corps. I think by the audiences' reactions over the past three years, we're doing our thing our way again, and the fans love it. Watch a video of the 2007 Bridgemen Alumni Corps at the DCI Eastern Classic.